The NYC Health Department has announced a national effort to reduce sugar in packaged foods by 20 percent by 2025. The National Salt and Sugar Reduction Initiative (NSSRI) is a partnership of nearly 100 local, city and state health departments, associations, and health organizations across the country. The NSSRI is advocating for lowering the amount of sugar in 13 different food and beverage categories: sweetened milk and milk substitutes; breakfast pastries; cakes; cookies; dry mixes; dairy-based and frozen desserts; sweet candies; chocolate candies; breakfast cereals; condiments; dessert syrups and toppings; yogurt; and sugary drinks. Targets were set for sugar reduction in each category and recommendations were released to the food and beverage industry with a request for comment. Currently, 68 percent of packaged foods and beverages purchased in the U.S. contain added sugar, making it difficult for individuals to reduce their sugar consumption. Intake of added sugars is associated with increased risk of excess weight, type 2 diabetes, hypertension, stroke, heart disease, and cavities. The Dietary Guidelines for Americans recommends limiting consumption of added sugars to 10 percent or less of daily caloric intake, the equivalent of about 12 teaspoons (approximately 200 calories) of added sugars for a 2,000 calorie diet, but the average American consumes about 17 teaspoons (approximately 270 calories) of added sugars each day. “Excessive sugar consumption is a major factor in the obesity, diabetes and heart disease epidemics. This is a public health crisis, like smoking. Working with manufacturers of prepared foods and beverages to lower sugar levels in their products is a sensible proactive step to improve public health,” said Assembly Member Richard N. Gottfried, Chair of the Assembly Health Committee. The NSSRI released two targets for each category based on sugar density: a sales-weighted mean and a maximum upper limit. 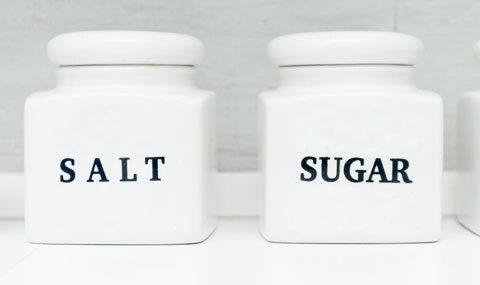 The sales-weighted mean would reduce the average sugar content across all products in each category; for most categories, it is based on a 20 percent reduction from the category’s baseline. The maximum upper limit would reduce the amount of sugar in the products with the highest sugar content within each category. Updated NSSRI targets will be released in 2019, and participating companies will commit to achieving the targets by 2025. The NSSRI started first with a focus on sodium in 2009. Then called the National Salt Reduction Initiative (NSRI), nearly 30 food companies committed to work towards NSRI-established sodium targets, including some of the nation’s largest manufacturers. Between 2009 and 2015, there was a 6.8 percent reduction in sodium levels among top selling processed foods, demonstrating that meaningful reformulation of food products is achievable within a short time period. · Requiring chain restaurants to post warning labels next to menu items that contain high levels of sodium. · Promoting farmers markets and the city’s fruit and vegetable financial incentive program, Health Bucks. · Launching educational campaigns on sugary drink consumption and healthy eating. · Mandating calorie labeling in chain restaurants and food retailers providing prepared foods. · Restricting trans fat use in restaurants. For additional information, search for “NSSRI” or “sugar reduction” on nyc.gov/health, email sugar@health.nyc.govor call 311.